The proclamation of faith is the first of the five pillars of the Islamic faith structure, followed by performing the five daily prayers, giving Zakat (charity), fasting the month of Ramadhan, and making the pilgrimage (Haj) to the First House of Allah on Earth, Al-Ka'aba, in Makkah. "أشهدُ أنَّ لا إلهَ إلاَّ الله ، وأشهدُ أنَّ مُحمداً رسولُ الله"
"I bear witness that there is no other god than (except) Allah, and I bear witness that Muhammed is the Messenger of Allah." شَهِدَ اللَّـهُ أَنَّهُ لَا إِلَـٰهَ إِلَّا هُوَ وَالْمَلَائِكَةُ وَأُولُو الْعِلْمِ قَائِمًا بِالْقِسْطِ ۚ لَا إِلَـٰهَ إِلَّا هُوَ الْعَزِيزُ الْحَكِيمُ (آل عمران ، 3: 18). إِنَّمَا إِلَـٰهُكُمُ اللَّـهُ الَّذِي لَا إِلَـٰهَ إِلَّا هُوَ وَسِعَ كُلَّ شَيْءٍ عِلْمًا (طه ، 20: 89). هُوَ اللَّـهُ الَّذِي لَا إِلَـٰهَ إِلَّا هُوَ عَالِمُ الْغَيْبِ وَالشَّهَادَةِ هُوَ الرَّ‌حْمَـٰنُ الرَّ‌حِيمُ (الحشر ، 59: 22). Allah has witnessed, so have the angels and those of knowledge, that there is no other god except Him, and that He is maintaining (Hi creation) with justice. There is no other god except Him, the Exalted in Might, the Wise (Al-'Imran, 3: 18). Your god is Allah, with Whom there is no other god. He has encompassed all things in knowledge (Taha, 20: 98). He is Allah, with Whom there is no other god, Knower of the unseen and the witnessed. He is the Beneficent (Merciful to all His creation), the Merciful (to the believers) (Al-'Hashr, 59: 22). Moreover, the Holy Quran not only includes God’s proclamation of His existence and His Oneness but it also contains His reasoning with humans, telling them that there can be no other god beside Him, in heavens and the Earth. Otherwise, they would be corrupted (destroyed), as mentioned in verse 21: 22. لَوْ كَانَ فِيهِمَا آلِهَةٌ إِلَّا اللَّـهُ لَفَسَدَتَا فَسُبْحَانَ اللَّـهِ رَ‌بِّ الْعَرْ‌شِ عَمَّا يَصِفُونَ (الأنبياء ، 21: 22). Had there been (in the heavens and earth) gods besides Allah, they both would have been corrupted (ruined). So exalted is Allah, Lord of the Throne, above what they describe (Al-Anbiya, 21: 22). وَمَا مُحَمَّدٌ إِلَّا رَسُولٌ قَدْ خَلَتْ مِن قَبْلِهِ الرُّسُلُ ۚ (آل عمران ، 3: 144). مَّا كَانَ مُحَمَّدٌ أَبَا أَحَدٍ مِّن رِّجَالِكُمْ وَلَـٰكِن رَّسُولَ اللَّـهِ وَخَاتَمَ النَّبِيِّينَ ۗ وَكَانَ اللَّـهُ بِكُلِّ شَيْءٍ عَلِيمًا (الأحزاب ، 33: 40). وَالَّذِينَ آمَنُوا وَعَمِلُوا الصَّالِحَاتِ وَآمَنُوا بِمَا نُزِّلَ عَلَىٰ مُحَمَّدٍ وَهُوَ الْحَقُّ مِن رَّبِّهِمْ ۙ كَفَّرَ عَنْهُمْ سَيِّئَاتِهِمْ وَأَصْلَحَ بَالَهُمْ (محمد ، 47: 2). مُّحَمَّدٌ رَّسُولُ اللَّـهِ ۚ وَالَّذِينَ مَعَهُ أَشِدَّاءُ عَلَى الْكُفَّارِ رُحَمَاءُ بَيْنَهُمْ ۖ (الفتح ، 48: 29). قُلْ يَا أَيُّهَا النَّاسُ إِنِّي رَ‌سُولُ اللَّـهِ إِلَيْكُمْ جَمِيعًا (الأعراف ، 7: 158). Muhammad is not but a messenger (of God). (Other) messengers have passed on before him (Al-'Imran, 3: 144). Muhammad is not the father of (any) one of your men, but (he is) the Messenger of Allah, and the seal (last) of the prophets. And Allah is, of all things, Knowing (Al-A'hzab, 33: 40). And those who have believed (in God), have done righteous deeds, and believed in what has been sent down upon Muhammad - and it is the truth from their Lord - He will remove from them their misdeeds and amend their condition (Muhammed, 47: 2). The Messenger of Allah, Muhammed, and those with him, are forceful against the disbelievers, merciful among themselves (Al-Fat'h, 48: 29). 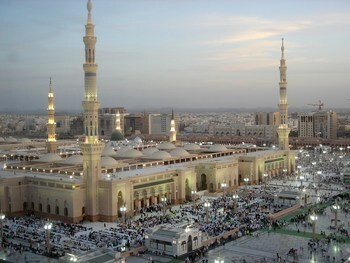 Say, (O Muhammed): "O mankind, indeed, I am the Messenger of Allah to you all (Al-A'araf, 7: 158). The Islamic proclamation of faith confirms the continuity of God’s guidance to humanity, as represented by the Messages He sent through His Messengers, from Adam to Muhammed, peace be upon all of them. As such, it gives peace of mind to the believers that they are not here by accident and they are not left lonely on this small planet, in God’s vast Universe. Thus, the proclamation of faith gives a profound meaning to the other ways of worship, as it puts them in the context of observing the Commands of the Creator, praise to Him. Performed properly, the ways of worship, contained in the Holy Quran, lead to happiness in this lower life and in the Hereafter. Verses 4: 164-165 tell us that there are others who were not mentioned in God’s Book. Like the ones who were mentioned, they were sent with God’s messages to guide people, give them glad tidings, and warn them against wrong-doing. So, people don’t have an excuse when they meet their Creator, for accountability, in the Hereafter. وَرُ‌سُلًا قَدْ قَصَصْنَاهُمْ عَلَيْكَ مِن قَبْلُ وَرُ‌سُلًا لَّمْ نَقْصُصْهُمْ عَلَيْكَ وَكَلَّمَ اللَّـهُ مُوسَىٰ تَكْلِيمًا (النساء ، 4: 164). رُّ‌سُلًا مُّبَشِّرِ‌ينَ وَمُنذِرِ‌ينَ لِئَلَّا يَكُونَ لِلنَّاسِ عَلَى اللَّـهِ حُجَّةٌ بَعْدَ الرُّ‌سُلِ وَكَانَ اللَّـهُ عَزِيزًا حَكِيمًا (النساء ، 4: 165). And (We sent) messengers about whom We have related (their stories) to you before, and messengers about whom We have not related to you. And Allah spoke to Moses with (direct) speech (Al-Nissa, 4: 164). (We sent) messengers as bringers of good tidings and warners, so that mankind will have no argument against Allah after the messengers. And ever is Allah Exalted in Might and Wise (Al-Nissa, 4: 165). Further, the Holy Quran tells us that Allah, praise to Him, sent Messengers and Prophets to guide people wherever they lived on Earth and confirmed that He won’t punish a nation without sending them His guidance and His warning first, as mentioned in verses 35: 24, 16: 36, and 17: 15. وَإِن مِّنْ أُمَّةٍ إِلَّا خَلَا فِيهَا نَذِيرٌ (فاطر ، 35:24). وَلَقَدْ بَعَثْنَا فِي كُلِّ أُمَّةٍ رَّسُولًا أَنِ اعْبُدُوا اللَّـهَ وَاجْتَنِبُوا الطَّاغُوتَ ۖ (النحل ، 16: 36). وَمَا كُنَّا مُعَذِّبِينَ حَتَّىٰ نَبْعَثَ رَسُولًا (الإسراء ، 17: 15). And there was no nation but that there had passed within it a warner (Fatir, 35: 24). 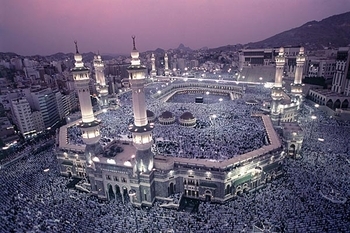 And We certainly sent into every nation a messenger (saying), "Worship Allah and avoid idol worship" (Al-Na’hl, 16: 36). And We would never punish until We sent a messenger (Al-Issra, 17: 15). إِنَّ الدِّينَ عِندَ اللَّـهِ الْإِسْلَامُ (آل عمران ، 3: 19). Indeed, the religion in the sight of Allah is Islam (submission to God) (Al-‘Imran, 3: 19). مَا كَانَ إِبْرَاهِيمُ يَهُودِيًّا وَلَا نَصْرَانِيًّا وَلَـٰكِن كَانَ حَنِيفًا مُّسْلِمًا وَمَا كَانَ مِنَ الْمُشْرِكِينَ (آل عمران ، 3: 67). Ibrahim (Abraham) was neither a Jew nor a Christian, but he was one inclining toward truth, a Muslim (submitting to Allah). And he was not of the polytheists (Al-‘Imran, 3: 67). أَمْ كُنتُمْ شُهَدَاءَ إِذْ حَضَرَ يَعْقُوبَ الْمَوْتُ إِذْ قَالَ لِبَنِيهِ مَا تَعْبُدُونَ مِن بَعْدِي قَالُوا نَعْبُدُ إِلَـٰهَكَ وَإِلَـٰهَ آبَائِكَ إِبْرَاهِيمَ وَإِسْمَاعِيلَ وَإِسْحَاقَ إِلَـٰهًا وَاحِدًا وَنَحْنُ لَهُ مُسْلِمُونَ (البقرة ، 2: 133). Or were you witnesses when death approached Ya’qoob (Jacob), when he said to his sons: "What will you worship after me?" They said, "We will worship your God and the God of your fathers, Ibrahim, Isma’il, and Iss’haq - One God. And we are Muslims (in submission) to Him" (Al-Baqara, 2: 133). فَلَمَّا أَحَسَّ عِيسَىٰ مِنْهُمُ الْكُفْرَ قَالَ مَنْ أَنصَارِي إِلَى اللَّـهِ ۖ قَالَ الْحَوَارِيُّونَ نَحْنُ أَنصَارُ اللَّـهِ آمَنَّا بِاللَّـهِ وَاشْهَدْ بِأَنَّا مُسْلِمُونَ (آل عمران ، 3: 52). But when ‘Eissa (Jesus) felt (persistence in) disbelief from them, he said, "Who are my supporters for (the cause of) Allah?" The disciples said, "We are supporters for Allah. We have believed in Allah, and (you Jesus) bear witness that we are Muslims (submitting to Him) (Al-‘Imran, 3: 52). First, a Messenger was a man who received inspiration and a new message from Allah, praise to Him, to tell it to the people. However, a Prophet was a man who received inspiration and a message from Allah to preach, educate, and remind people of a message sent to a previous Messenger. In verse 3:19 (above), Allah, praise to Him, has stated that all His messages to humanity constitute one religion, Islam. In verse 5: 3, He further stated that He completed the religion of Islam to humanity, with the revelation of the Holy Quran. Thus, there is no need for any more messengers, as He promised, in verse 15: 9, that He would to preserve His final message intact. الْيَوْمَ أَكْمَلْتُ لَكُمْ دِينَكُمْ وَأَتْمَمْتُ عَلَيْكُمْ نِعْمَتِي وَرَضِيتُ لَكُمُ الْإِسْلَامَ دِينًا ۚ (المائدة ، 5: 3). This day I have perfected for you your religion and completed My favor upon you and have approved for you Islam as religion (Al-Ma-ida, 5: 3). إِنَّا نَحْنُ نَزَّلْنَا الذِّكْرَ وَإِنَّا لَهُ لَحَافِظُونَ (الحجر ، 15: 9). Indeed, it is We, who sent down the Quran and indeed, We will be preserving it (Al-‘Hijr, 15: 9). Thus, Muhammed, pbbuh, was the last of God’s Messengers. He was also described as the last of the Prophets, in verse 33: 40. So, there will be no need for prophets to preach, educate, and teach people about God’s Book, like what Prophets did after Moussa (Moses), peace be upon him, as we are told by Verse 5: 44. This job will be maintained by the scholars, who are mentioned in verse 3: 18 (above) with high regards, directly after mentioning Allah and the angels. مَّا كَانَ مُحَمَّدٌ أَبَا أَحَدٍ مِّن رِّجَالِكُمْ وَلَـٰكِن رَّسُولَ اللَّـهِ وَخَاتَمَ النَّبِيِّينَ ۗ (الأحزاب ، 33: 40). Muhammad was not the father of (any) one of your men, but (he was) the Messenger of Allah and last of the prophets (Al-A'hzab, 33: 40). إِنَّا أَنزَلْنَا التَّوْرَ‌اةَ فِيهَا هُدًى وَنُورٌ‌ يَحْكُمُ بِهَا النَّبِيُّونَ الَّذِينَ أَسْلَمُوا (المائدة ، 5: 44). We sent down the Torah, in which (there) was guidance and light. The prophets who submitted (themselves to Allah; were Muslims) judged by it (Al-Ma-ida, 5: 44). The second major difference between Prophets and Messengers of God is that messengers were supported with physical miracles, to help them convince people that they were Messengers of Allah. Examples of these miracles were Noo’h's Arch, Salih's she-camel, rescuing Ibrahim from the fire, Moussa's stick (staff), 'Eissa's healing, and revealing the Holy Quran to Muhammed. Moreover, the messages they told people included prophecies about future events, which would reinforce people’s faith when they happen. Prophets were supported by their ability to prophesize, telling about future events. As people saw these prophecies come true, they listened more attentively to the teachings of the prophets about God’s previous messages. Because Messengers of God also brought prophecies, part of the new messages revealed to them, they were both messengers and prophets. However, prophets were not messengers in the sense that they were not given new messages to tell people about. Thus, a messenger was also a prophet, but a prophet was not a messenger. Allah, praise to Him, supported His Messenger, Muhammed, pbbuh, with the greatest miracle, the Holy Quran, the verses of which represent clear scientific facts people discover century after century. These are pieces of evidence that this Book is the Word of God, which does not contain any falsehood (41: 42), as demonstrated in Part I and other Parts of this book, particularly in the third and fourth chapters. The Holy Quran is the greatest miracle because it is continuous in its existence intact, without any changes, it is God’s Message to the whole of humanity, across time. Other miracles, which God supported His Messengers with, aimed at influencing a particular group of people, who were alive at the time of the miracle incidence. Thus, such miracles did not target the whole of humanity, as the Holy Quran does. Moreover, in his ‘Hadiths (sayings), the Prophet, pbbuh, told his Companions many prophecies about future events. Some of these prophecies have already come true and others are still to be seen in the future. Here are some examples of such ‘Hadith prophecies. “The Hour will not come until the (religious) scholarship disappears, earthquakes increase, time is shortened, upheavals emerge, killing increases, and wealth increases among you until it exceeds the need (Narrated by Al-Bukhari, 1036). “The Hour will not come … until Arabia will again have rivers and grasslands” (Narrated by Muslim, 1681). “The Guided (Al-Mahdi) is one of my descendants. He will have a broad forehead and a hump nose (a little high in the middle). He will fill the Earth with justice, after a period of injustice and oppression. And he will rule for seven years” (Narrated by Abu Dawood, 4285, and was considered a correct ‘Hadith by Al-Albani, 6736). “It will not happen until you see ten signs happening before it. Then, he mentioned the smoke, the fake messiah, the beast, the sun rising from the west, descent of ‘Eissa (Jesus) peace be to him, Yajooj and Majooj (Gog and Magog), three eclipses in the east, west, and Arabia. Finally, a fire coming out from Yemen, which drives people (north) to their gathering place (Narrated by Muslim, 2901). The Islamic proclamation of faith is the first of the five pillars of the Islamic faith structure. It gives peace of mind to the worshippers that they are not here by accident and they are not left lonely on Earth. Allah, the Merciful and Compassionate Creator, out of His love and care, has completed His messages of guidance to humanity by sending His Final Message through His final Messenger, Muhammed, peace and blessings be upon him. The first part of the proclamation represents recognition of the oneness of God, the Creator of the Universe, the Merciful of His creation. It also represents an acceptance of His Messages and His Messengers. The second part of the proclamation recognizes Muhammed, pbbuh, as the final of God’s Messengers and Prophets. It also represents acceptance of the Holy Quran, as God’s Message, which was revealed to humanity through him. Thus, the proclamation of faith gives a profound meaning to the other ways of worship. It puts them in the context of obedience to the Creator, Allah, praise to Him, by observing His commands. This maximizes the benefits people get from performing the various ways of worship. The end outcome for people is that they live happily in this life and gain His everlasting reward of living in Paradise forever, in the hereafter. The study of and contemplation about the Holy Quran and ‘Hadith prophecies reinforce the faith of the believers, as it provides them with assurance that they are on the right path of happiness, here and in the hereafter. More information about the benefits of performing these four ways of worship can be found in Chapter 8 of in this book: "The Relationship Between the Spiritual and the Physical Aspects of Islamic Teachings." For information about God’s final Messenger to humanity, see Chapter 22, "Muhammed in the Holy Quran," and Chapter 23, "Prophet Muhammed's Night Journey and Ascent to Heavens, Al-Issra Wal Mi'raj." God’s oneness is mentioned 37 times in 36 verses, in the Holy Quran. The proclamation that “there is no other god than (except) He” is mentioned in 30 verses. These are 2: 163, 2: 255, 3: 2, 3: 6, 3: 18 (twice), 4: 87, 6: 102, 6: 106, 7: 158, 9: 31, 9: 129, 11: 14, 13: 30, 20: 8, 20: 98, 23: 116, 27: 26, 28: 70, 28: 88, 35: 3, 39: 6, 40: 3, 40: 62, 40: 65, 44: 8, 59: 22, 95: 23, 64: 13, and 73: 9. In addition, there are two verses in which the proclamation states that “there is no other god than (except) Allah” (37: 35, 47: 19). The proclamation that “there is no other god than (except) Me” is mentioned three times (16: 2, 20: 14, and 21: 25). God’s oneness is also mentioned once, by Younus (Jonah), peace be to him (21: 87), and once by the Pharaoh (10: 90), when it was too late for him to acknowledge it. The following verses mention the names of the twenty-five messengers and prophet, including the five major messengers, known as “the Ones with Power” (Ulul 'Azm): Noo’h, Ibrahim, Moussa, ‘Eissa, and Muhammed, peace and blessings of Allah be upon all of them. آدم ، وإدريس ، ونوح ، وهود ، وصالح ، وإبراهيم ، ولوط ، وإسماعيل ، وإسحاق ، ويعقوب ، ويوسف ، وأيوب ، وشعيب ، وموسى ، وهارون ، وداود ، وسليمان ، وإلياس ، والْيَسَع ، ويونس ، وذو الكفل ، وزكريا ، ويحيى ، وعيسى ، ومحمد ، عليهم الصلاة والسلام أجمعين. Thus, the twenty-five Messengers and Prophets, mentioned in the Holy Quran are Adam, Idris (Enokh, Akhnokh), Noo’h (Noah), Hood, Sali’h, Ibrahim (Abraham), Loot (Lot), Issma’il, Iss’haq (Isaac), Ya’qoob (Jacob), Yousuf (Joseph), Ayoob (Job), Shy’ayb, Moussa (Moses), Haroon (Aaron), Dawood (David), Sulayman (Solomon), Elyas (Elias or Elijah), Elyasa’ (Elisha), Younus (Johah), Dhul Kifl, Zakariya (Zacharia), Ya’hya (John), ‘Eissa (Jesus), and Mu’hammed, peace and blessings of Allah be upon them all. Note: The above list of God’s Messengers and Prophets is based on the Arabic text of the Holy Quran, with the biblical names in parentheses. However, four of them are without biblical names because there is no agreement on them being mentioned in the Bible. These are Hood, Sali’h, Shu’ayb, and Dhul Kifl. However, some authors identified them as Eber, Salah (Shelah), Jethro, and Ezekeil, respectively, but without evidence. وَإِسْمَاعِيلَ وَالْيَسَعَ وَيُونُسَ وَلُوطًا وَكُلًّا فَضَّلْنَا عَلَى الْعَالَمِينَ ﴿٨٦﴾ (الأنعام ، 6: 83-86). And Issma’il (Ishmael), Elyassa’ (Elisha), Younus (Jonah), and Loot (Lot) - and all (of them) We preferred over the worlds. (86) (Al-An'am, 6: 84-86). وَإِسْمَاعِيلَ وَإِدْرِ‌يسَ وَذَا الْكِفْلِ كُلٌّ مِّنَ الصَّابِرِ‌ينَ (الأنبياء ، 21: 85). And (mention) Isma’il, Idrees, and Dhul-Kifl; all were of the patient (Al-Anbiya, 21: 85). وَإِلَىٰ مَدْيَنَ أَخَاهُمْ شُعَيْبًا (الأعراف ، 7: 85). And to (the people of) Madyan, (We sent) their brother Shu'ayb (Al-A'araf, 7: 85). وَيَا قَوْمِ لَا يَجْرِ‌مَنَّكُمْ شِقَاقِي أَن يُصِيبَكُم مِّثْلُ مَا أَصَابَ قَوْمَ نُوحٍ أَوْ قَوْمَ هُودٍ أَوْ قَوْمَ صَالِحٍ وَمَا قَوْمُ لُوطٍ مِّنكُم بِبَعِيدٍ (هود ، 11: 89). And O my people, let not (your) dissension from me cause you to be struck by that similar to what struck the people of Noo’h or the people of Hood or the people of Salih. And the people of Loot are not from you far away (Hood, 11: 89). إِنَّ اللَّـهَ اصْطَفَىٰ آدَمَ وَنُوحًا وَآلَ إِبْرَ‌اهِيمَ وَآلَ عِمْرَ‌انَ عَلَى الْعَالَمِينَ (آل عمران ، 3: 33). Allah chose Adam, Noo’h, the family of Ibrahim, and the family of 'Imran over the worlds (Al-'Imran, 3: 33). وَمَا مُحَمَّدٌ إِلَّا رَ‌سُولٌ قَدْ خَلَتْ مِن قَبْلِهِ الرُّ‌سُلُ (آل عمران ، 3: 144). Muhammed is not but a messenger, (other) messengers have passed on before him (Al-'Imran, 3: 144). There are 21 verses in the Holy Quran, which refer to previous Prophets, Messengers of Allah, and their followers as Muslims (those who submit their will to God). These are 2: 128, 2: 132, 2: 133; 2: 136, 3: 19, 3: 52, 3: 67, 3: 84, 5: 111, 6: 163, 7: 126, 10: 72, 10: 84, 10: 90, 12: 101, 27: 31, 27: 38, 27: 42, 28: 53; 51: 36; 72: 14. 1. We had certainly sent Noo’h (Noah) (as a messenger) to his people (Al-A’raf, 7: 59; Hood, 11: 25). لَقَدْ أَرْسَلْنَا نُوحًا إِلَىٰ قَوْمِهِ (الأعراف ، 7: 59 ، هود ، 11: 25). 2. When their brother Hood said to them, "Will you not fear Allah? (124) Indeed, I am to you a trustworthy messenger (125) (Al-Shu’ara, 26: 124-125). إِذْ قَالَ لَهُمْ أَخُوهُمْ هُودٌ أَلَا تَتَّقُونَ ﴿١٢٤﴾ إِنِّي لَكُمْ رَسُولٌ أَمِينٌ ﴿١٢٥﴾ (الشعراء ، 26: 124-125). 3. When their brother Sali’h said to them, "Will you not fear Allah? (124) Indeed, I am to you a trustworthy messenger (125) (Al-Shu’ara, 26: 124-125). إِذْ قَالَ لَهُمْ أَخُوهُمْ صَالِحٌ أَلَا تَتَّقُونَ ﴿١٤٢﴾ إِنِّي لَكُمْ رَسُولٌ أَمِينٌ ﴿١٤٣﴾ (الشعراء ، 26: 142). وَلَقَدْ أَرْسَلْنَا نُوحًا وَإِبْرَاهِيمَ وَجَعَلْنَا فِي ذُرِّيَّتِهِمَا النُّبُوَّةَ وَالْكِتَابَ ۖ فَمِنْهُم مُّهْتَدٍ ۖ وَكَثِيرٌ مِّنْهُمْ فَاسِقُونَ (الحديد ، 57: 26). 5. And indeed, Loot (Lot) was among the messengers (Al-Saffat, 37: 133). وَإِنَّ لُوطًا لَّمِنَ الْمُرْسَلِينَ (الصافات ، 37: 133). 6. And mention in the Book, Issma’il (Ishmael). Indeed, he was true to his promise, and he was a messenger and a prophet (Maryam, 19: 54). وَاذْكُرْ فِي الْكِتَابِ إِسْمَاعِيلَ ۚ إِنَّهُ كَانَ صَادِقَ الْوَعْدِ وَكَانَ رَسُولًا نَّبِيًّا (مريم ، 19: 54). 7. And Moossa (Moses) said, "O Pharaoh, I am a messenger from the Lord of the worlds (Al-A’raf, 7: 104). وَقَالَ مُوسَىٰ يَا فِرْعَوْنُ إِنِّي رَسُولٌ مِّن رَّبِّ الْعَالَمِينَ (الأعراف ، 7: 104). 8. Go both (Moossa and Haroon, Moses and Aaron) to Pharaoh and say, 'We are a messenger of the Lord of the worlds (Al-Shu’ara, 26: 16). فَأْتِيَا فِرْعَوْنَ فَقُولَا إِنَّا رَسُولُ رَبِّ الْعَالَمِينَ (الشعراء ، 26: 16). So go both to him (Pharaoh) and say, 'Indeed, we both are two messengers of your Lord. So, send with us the Children of Israel, and do not torment them (Ta Ha, 20: 47). فَأْتِيَاهُ فَقُولَا إِنَّا رَسُولَا رَبِّكَ فَأَرْسِلْ مَعَنَا بَنِي إِسْرَائِيلَ وَلَا تُعَذِّبْهُمْ ۖ (طه ، 20: 47). In verse 26: 16, both Moossa and Haroon (Moses and Aaron) were presented as one Messenger of Allah. However, in verse 20: 47, they were presented as two Messengers of Allah. Thus, the meaning is that they were two Messengers carrying one message, asking the Pharaoh to allow the Israelites to leave Egypt. Actually, Allah chose Moossa to be His Messenger but he asked his Lord to send Haroon with him because he was more eloquent. 9. And indeed, Elyas (Elijah) was from among the messengers (Al-Saffat, 37: 123). وَإِنَّ إِلْيَاسَ لَمِنَ الْمُرْسَلِينَ (الصافات ، 37: 123). 10. And indeed, Yoonus (Jonah) was from among the messengers (Al-Saffat, 37: 139). وَإِنَّ يُونُسَ لَمِنَ الْمُرْسَلِينَ (الصافات ، 37: 139). 11. The Messiah, ‘Eissa (Jesus), the son of Mary, was but a messenger of Allah (Al-Nissa, 4: 171). إِنَّمَا الْمَسِيحُ عِيسَى ابْنُ مَرْيَمَ رَسُولُ اللَّـهِ (النساء ، 4: 171). 12. Muhammed was not the father of (any) one of your men, but (he is) the messenger of Allah and last of the prophets (Al-A’hzab, 33: 40). Adam and Dawood (David), peace be to them, were unique, among Prophets, in that Allah sent them Words and Psalms, to be recited in His praise, and for them to ask for His forgiveness and His support. Then Adam received from his Lord Words, and He accepted his repentance (Al-Baqara, 2: 37). فَتَلَقَّىٰ آدَمُ مِن رَّبِّهِ كَلِمَاتٍ فَتَابَ عَلَيْهِ ۚ إِنَّهُ هُوَ التَّوَّابُ الرَّحِيمُ (البقرة ، 2: 37). … and to Dawood (David) We gave (the book of) Psalms (Al-Issra, 17: 55). وَآتَيْنَا دَاوُودَ زَبُورًا (الإسراء ، 17: 55). So, be patient (O Muhammad), as were those of determination among the messengers (Al-A’hqaf, 46: 35). فَاصْبِرْ كَمَا صَبَرَ أُولُو الْعَزْمِ مِنَ الرُّسُلِ (الأحقاف ، 46: 35). He has ordained for you of the religion what He enjoined upon Noo’h (Noah), and that which We have revealed to you (O Muhammed), and what We enjoined upon Ibrahim (Abraham), Moosa (Moses), and ‘Eissa (Jesus) (Al-Shura, 42: 13). شَرَعَ لَكُم مِّنَ الدِّينِ مَا وَصَّىٰ بِهِ نُوحًا وَالَّذِي أَوْحَيْنَا إِلَيْكَ وَمَا وَصَّيْنَا بِهِ إِبْرَاهِيمَ وَمُوسَىٰ وَعِيسَىٰ ۖ (الشورى ، 42: 13). The calculated flying distance from Makkah (Mecca) to Al-Quds (Jerusalem) is equal to 769 miles and the current fastest human air craft (NASA X-43) has a speed of 6,598 miles per hour. This means that the distance between Makkah and Al-Quds can be traveled in less than seven minutes (exactly 6 minutes and 54 seconds). This is the current human capability, let alone the future progress, and not to mention the divine capability of God, Who assigned the one-with-power, Jibril (Gabriel’s), peace to him, for that job. The calculated flying distance from Makkah to Jerusalem is equal to 769 miles. When the Persians defeated the Romans in 614-615 AD, Muslims were sad, because Romans were closer to them in faith, as they were considered among People of the Book (Christians). Verses 30: 2-5 were revealed, giving glad tidings to the believers that the Romans would defeat the Persians in few (3-9) years. This Quran prophecy came true in about eight years, in 622-624 AD. الم ﴿١﴾ غُلِبَتِ الرُّومُ ﴿٢﴾ فِي أَدْنَى الْأَرْضِ وَهُم مِّن بَعْدِ غَلَبِهِمْ سَيَغْلِبُونَ ﴿٣﴾ فِي بِضْعِ سِنِينَ ۗ لِلَّـهِ الْأَمْرُ مِن قَبْلُ وَمِن بَعْدُ ۚ وَيَوْمَئِذٍ يَفْرَحُ الْمُؤْمِنُونَ ﴿٤﴾ بِنَصْرِ اللَّـهِ ۚ يَنصُرُ مَن يَشَاءُ ۖ وَهُوَ الْعَزِيزُ الرَّحِيمُ ﴿٥﴾ (الروم ، 30: 1-5). Exalted in Might, the Merciful. (5) (Al-Room, 30: 1-5). Moreover, verse 30: 2 described the location of the battles, in which the Romans were defeated, as the “lowest land” (lowest part of Earth), a term which was not correctly understood by Muslim scholars before the last few decades of the 19th Century. The battles took place on Al-Ghoar (low land) of Bilad Al-Sham (currently known as Syria, Jordan, and Palestine), where the Jordan River and the Dead Sea are located. It’s a well-known fact now that this is the lowest area on Earth, as it is more than 400 meters below the sea level. Thus, this verse turned to be one of the scientific miracles of the Holy Quran, mentioned in the context of this prophecy. See also: Holland, Cecilia. 2018. “Heraclius Brings Persia to Its Knees.” History Net, in which the author mentioned the Quran verse and the year the Romans were defeated by the Persians, i.e. 614. "وَإِن مِّنْ أَهْلِ الْكِتَابِ إِلَّا لَيُؤْمِنَنَّ بِهِ قَبْلَ مَوْتِهِ ۖ وَيَوْمَ الْقِيَامَةِ يَكُونُ عَلَيْهِمْ شَهِيدًا" (النساء ، 4: 159). And all the People of the Scripture will surely believe in him (Jesus) before his death. 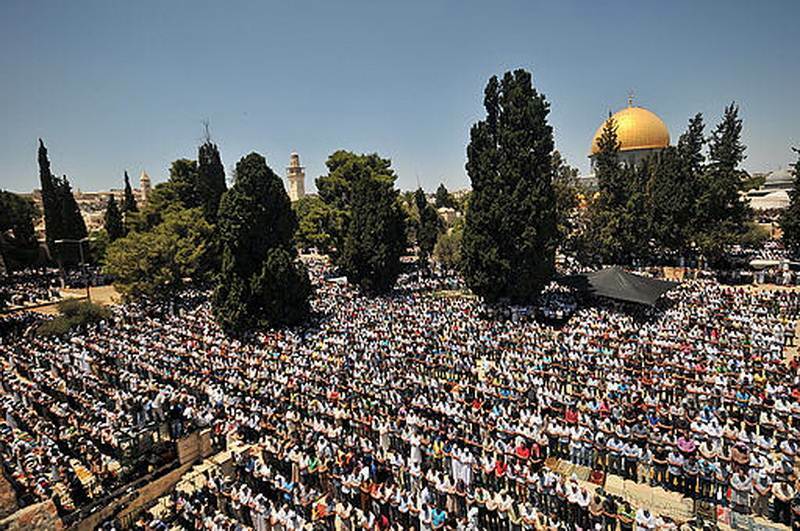 And on the Day of Resurrection, he will be a witness against them (Al-Nissa, 4: 159). And there is none from the People of the Scripture but that he will surely believe in Jesus before his death. And on the Day of Resurrection he will be against them a witness (Al-Nissa, 4: 159). The Holy Quran tells us, in verse4: 157, that Jesus, peace be to him, did not die, in his first mission on Earth, as Allah lifted him to heavens. He’ll be there until he is commanded to descend to Earth for his second mission, during which all People of the Book (including Jews) will believe in him. Then, he will die upon completing that second mission (This also was the interpretation of Al-‘Hassan, Al-Dha’hak, and Sa’id Bin Jubair, as narrated by Al-Tabari). And their saying, "Indeed, we have killed the Messiah, Jesus, the son of Mary, the messenger of Allah." And they did not kill him, nor did they crucify him; but (another) was made to resemble him to them. And indeed, those who differ over it are in doubt about it. They have no knowledge of it, except the following of assumption. And they did not kill him, for certain (Al-Nissa, 4: 157). فعن أبي هريرة ، رضي الله عنه ، أن رسُول اللهِ ، صَلَّى اللهُ عليهِ وَسَلَّمَ ، قال: "إِذَا هَلَكَ كِسْرَى فَلَا كِسْرَى بَعْدَهُ ، وَإِذَا هَلَكَ قَيْصَرُ فَلَا قَيْصَرَ بَعْدَهُ ، وَالَّذِي نَفْسِي بِيَدِهِ لَتُنْفَقَنَّ كُنُوزُهُمَا فِي سَبِيلِ اللَّهِ" (صحيح البخاري). "أن ترى الحفاة العراة العالة رعاء الشاء يتطاولون في البنيان" (رواه مسلم – نص الحديث كاملاً في الفصل الثاني من الجزء الأول لهذا الكتاب). عن أبي هريرة ، رضي الله عنه ، قال: قال النبي ، صلى الله عليه وسلم: "لا تقوم الساعة حتى يُقبَض العلم ، وتَكثُر الزلازل ، ويتقارَب الزمان ، وتظهر الفِتن ، ويَكثُر الهرَج (وهو القتل) ، حتى يَكثر فيكم المال ، فيَفيض" (رواه البخاري ، 1036). فعن أبي هريرة ، رضي الله عنه ، عن رسول الله ، صلى الله عليه وسلم ، أنه قال: "لَا تَقُومُ السَّاعَةُ ... حَتَّى تَعُودَ أَرْضُ الْعَرَبِ مُرُوجًا وَأَنْهَارًا" (رواه مسلم ، 1681). Parton, Ash et al. 2015. “Alluvial fan records from southeast Arabia reveal multiple windows for human dispersal.” Geology, 43 (4): 295-298. Marshall, Michael. 2015. “Arabia was once a lush paradise of grass and woodlands.” BBC (February 23). See also the book, written about the subject, by Abdul Sattar Al-Shaikh, in four volumes (2064 pages), titled as “Prophecies of the Messenger, pbbuh: Lessons and Parables,” which was issued by the Qatari Ministry of Endowment and Islamic Affairs, in 1433 Hijriya, 2012. "نبوءات الرسول ، صلى الله عليه وسلم: دروس وعبر" ، تأليف عبد الستار الشيخ (1433\2012) ، من إصدار وزارة الأوقاف والشئون الإسلامية ، في قطر. عن أبي سعيد الخُدري ، رضي الله عنه ، قال: قال رسول الله ، صلى الله عليه وسلم: "المهدي مني ، أجْلى الجَبهة ، أقْنَى الأنف ، يَملأ الأرض قسطًا وعدلاً ، كما مُلِئتْ جَورًا وظلمًا ، ويَملِك سبع سنين" (رواه أبو داود ، 4285 ، وصحَّحه الألباني في صحيح الجامع ، 6736). وعن حذيفة بن أَسيد الغفاري ، رضي الله عنه ، قال: اطَّلع النبي ، صلى الله عليه وسلم ، علينا ونحن نتذاكر، فقال: "ما تَذاكرون؟" قالوا: نذكر الساعة. قال: "إنها لن تقوم حتى ترونَ قبلها عشر آيات. فذكَر الدُّخان والدجَّال ، والدابَّة ، وطلوع الشمس من مغربها ، ونزول عيسى ابن مريم ، صلى الله عليه وسلم ، ويأجوج ومأجوج ، وثلاثة خسوفٍ: خسف بالمشرق ، وخسْف بالمغرب ، وخسْف بجزيرة العرب. وآخر ذلك نار تَخرج من اليمن تَطرد الناس إلى مَحشرهم" (رواه مسلم (2901). The long ‘Hadith, narrated by Al-Nawwas Bin Sam’an, is the first in Part 370 of the paper copy of “Riyadh Al-Sali’heen” by Imam Al-Nawawi, numbered as 1805 (Published by Dar Al-Arabiya, Beirut, Lebanon). It is also followed by 11 more ‘Hadiths, numbered 1806-1816, all of which provide more information about the return of ‘Eissa (Jesus), peace be to him, and the fake messiah.